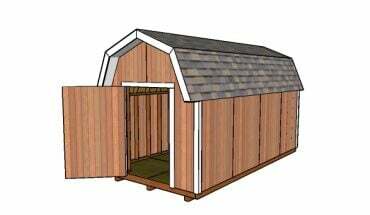 This step by step article is about how to build a tool shed. If you like to make home repairs and to build different things in the weekends, you must have lots of tools. If the garage is not large enough to store them properly, or you need more space for them, then you should consider building a lean-to tool shed. In this article, we show you show to design the tool as to fit your needs, as well as how to assemble the frame and choose the right materials. After you get the job done, you could lay the shed on a concrete slab or on top of several concrete piers. There are many designs and shapes you could choose from, therefore you should select the plans that fit your needs and tastes perfectly. If you don’t find the right project for your needs, you could adjust the size of the tools shed, as to store all your tools. We recommend you to measure the size of your tools that you needs to store, before deciding teh shape and dimensions of your small storage shed. Select the lumber with great care, if you want to build a durable shed. Nevertheless, we all know that most of the lumber pieces are not perfectly straight. Moreover, the most common issue is the so-called “bowing”. In case you have to build with bowed lumber, we recommend to install them with the crown upward-oriented. In this manner, the weight of the construction might mild the joists issue, over the years. 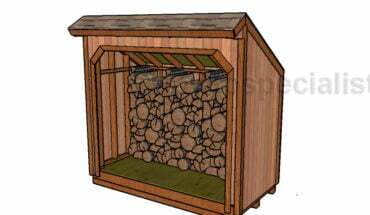 If you are an amateur handyman and you have acquired many tools over the years, but you don’t a place to store them properly, then a small lean-to shed is what you need. On one hand, you could buy a kit from your local diy store, while on the other hand you could build it by yourself, as it is a lot easier than you might imagine. Smart Tip: It is essential to design the tool shed as to fit your needs perfectly. Therefore, you should adjust the size and the shape of the project, according to your tastes. Nevertheless, if you want a straightforward job and save space, a lean-to shed is the solution to your problems. First of all, you need to build the frame of the floor. 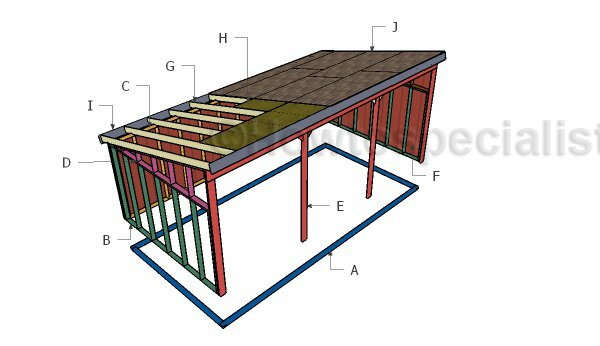 Therefore, you should use 2×4 pressure-treated lumber, as the slats are rigid enough for building the base and the frame of the small shed. 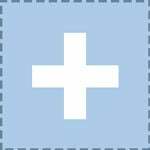 Measure the diagonals of the rectangle, making sure they are equal and the corners are right-angled. Drill pilot holes in the rim joists, at least 1/2” from the edges, before inserting the 3” wood screws, in order to prevent the wood from splitting. Afterwards, attach the plywood flooring the the frame, as in the image. In order to get the job done in a professional manner, we recommend you to use thick plywood or OSB, such as 1/2” plywood. Cut the plywood with a sharp blade with downward oriented teeth. Smart Tip: Make sure the plywood sheet is aligned at all edges, before inserting the 1 1/2” wood screws. Don’t over-tighten the screws, to prevent the plywood from damaging. Next, you have to build the frame of the walls and to install them into place. The easiest method to get the job done quickly and accurately is to assemble the frames on the ground, on a level surface, before fitting them into place with 3” screws. Use a spirit level to plumb the wall frames, before locking them onto the flooring. Cut the top of the studs at 15º, to obtain a proper slope for the roof. Continue the woodworking project, by installing the roof rafters of the tool shed, as well as the supports for the shelves. In order to obtain a professional result, we recommend you to cut both ends of the rafters at 15º, as you could see in the image. Drill pilot holes in the components, at angle, before driving in the 3” screws, in order to prevent the wood from splitting. Align the components, making sure they are equally spaced and secured properly. After building the frame of the tool shed, you have to attach the 5/8” grooved siding and lock it into place with 1 1/4” nails. 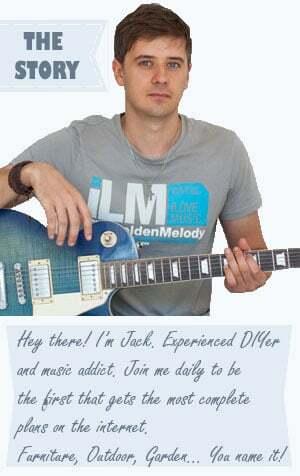 Work with great attention and good judgement, if you want to obtain a professional result. Smart Tip: Cut the siding with a sharp saw, making sure you don’t tear the edges of the sheets. Clamp the siding into place and drive in nails every 4”, in the frame of the shed. Building the doors of the tool shed is the most exiting part of the project, as you have the opportunity to create something unique with your own hands. As you can easily see in the plans, first you have to attach the trims to the front of the diy shed. Build the door from 5/8” siding and using 1×3 trims. Attach the trims to the siding and lock them into place with 1 1/4 nails. Make sure the doors fit into place, before installing the hinges. The next step of this diy project is to build the roof of the lean-to tool shed. The quickest method to get the job done is to use 1×4 or 1×6 tongue and groove slats. Work with great care, making sure the wooden boards are aligned properly, at both hands. Smart Tip: Lock the slats into place with 2” nails. Drive in two nails in each board, at both ends. The slats should have a 2” front and back overhang, to protect the shed from water damage. After you have assembled the storage shed, you should take care of the finishing touches. Therefore, fill the gaps with wood putty, let it to dry out properly and sand the wooden surface with medium-grit sandpaper. Smart Tip: Protect the lumber from rot and water damage, by applying several coats of paint. Build the shelves from 1/2” plywood and install them on the brackets. Thank you for reading our article about how to build a tool shed and we recommend you to check out the rest of our projects. Don’t forget to share our articles with your friends, by using the social media widgets.